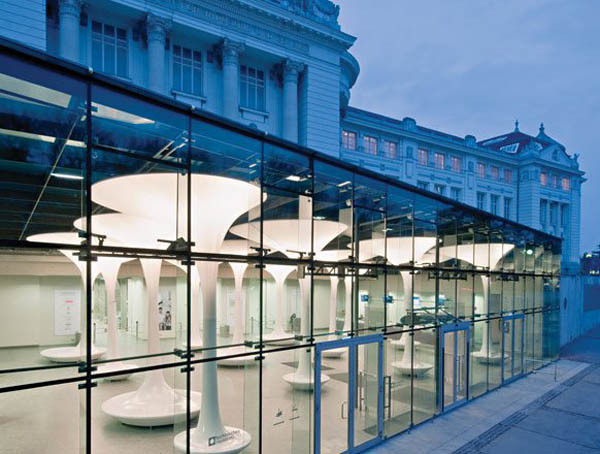 Querkraft Architects, together with the Technical Museum of Vienna, designed a new entrance foyer and shop for the existing building. 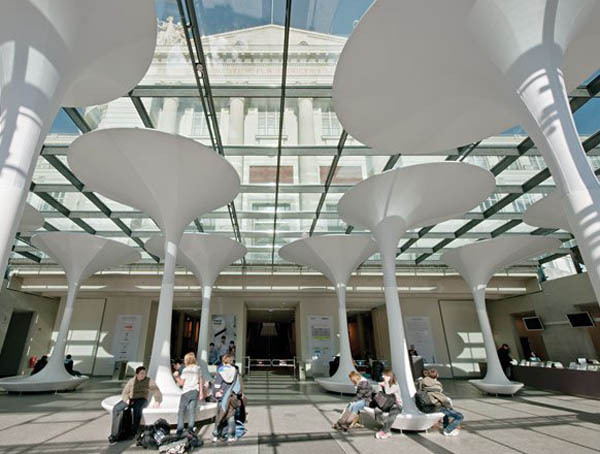 Older museum buildings are challenged to expand and modernize whilst remaining attached to their existing historical structures. In the 90s the technical museum faced precisely this difficulty as it tried to gain more space for a larger entrance foyer, a new museum shop and café as well as sufficient amenities, cloakroom space and ticketing capacity. The architectural solution that was chosen in the 90s was a steel-glass box placed in front of the existing historical structure. This solution proved problematic on a few levels shortly after the opening in 1999. The foyer was dominated by large temperature fluctuations, poor acoustics and ventilation, as well as less than optimal visitor circulation. 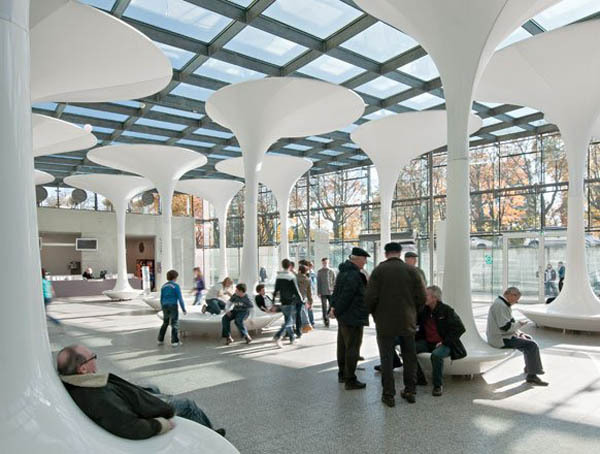 The creation of a clear master plan and visitor circulation with an accompanying welcoming emotional atmosphere improved the overall experience of the building. At the middle of their design solution are multifunctional pieces of furniture made of glass-fiber reinforced plastic and fabric. 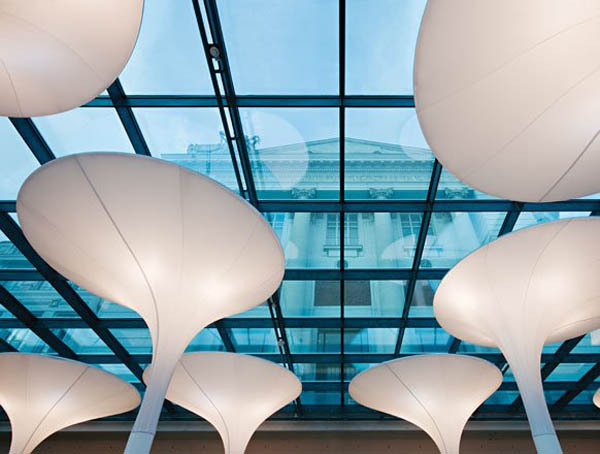 These ‘trees’ provide seating, shade and acoustic absorption and at night they serve as an illuminate bodies which fill the room with white or blue glowing light. 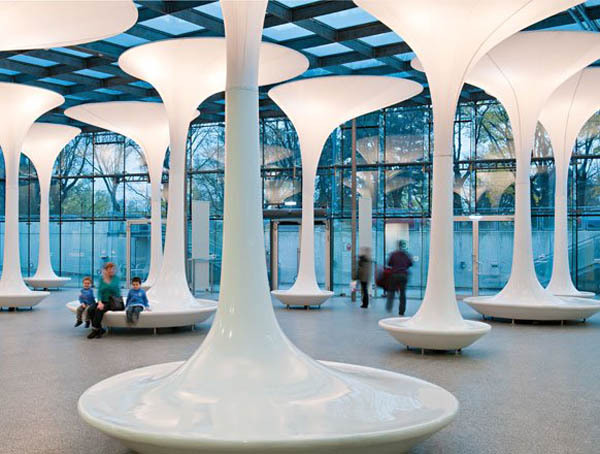 The objects, which resemble trees and can be perceived as a innuendo to the relationship between technology and nature, formally envelope the steel columns and allow a view through the glass ceiling and on to the historical façade.